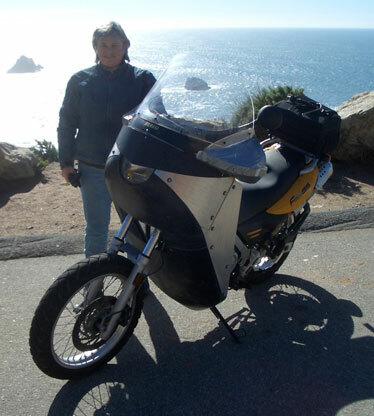 In 2005, my wife, Carol, got a BMW GS650 in anticipation of riding to Alaska. She asked me to design a fairing for her. Sounded good to me. Designing fairings is what I do. 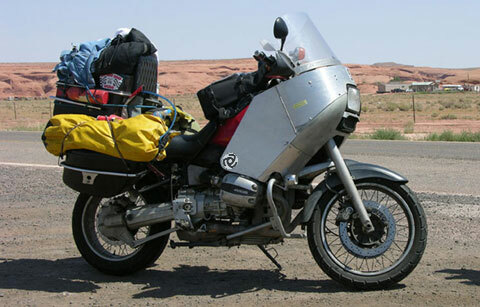 Since my last touring fairing was the Windjammer 7* of 1983, much has changed in motorcycling. Making a new fairing for Carol would be a great time to make a break with the past. Now, this is not what most Vetter fans want to hear. They want a new Windjammer. Sorry, I cannot go back. Besides, there are plenty of Windjammers out there. Just go on EBAY and buy one. I have an entire page dedicated to making new Windjammer mounting brackets for the 500,000 Windjammers made. For today, I wanted something more utilitarian and rugged. Designing for the Alcan Highway would be a great challenge. * I designed a Windjammer 6 and 7 for Bell who by 1983, owned my company. By 1987 or so, Bell decided to get out of the fairing business and never produced those fairings. Sometime I will show you those designs. I made seven prototypes for ourselves and friends' dual-sport bikes. But in 2007, I got sidetracked when I decided to design a fairing for maximum mileage. I figured it would be my last fairing design ever and refer to it as the "Last Vetter Fairing." The never-ending saga of my quest for fuel economy begins in "The Search for Fuel Economy." That project is temporarily stalled for lack of a suitable 14 hp powertrain. In the meantime, we have put thousands of miles on these protype fairings. 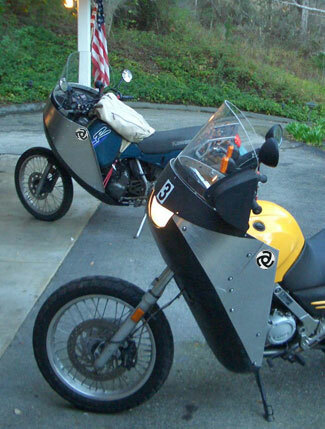 Our friend, Henry, has put many more thousands of miles on the prototype fairing #5 on his BMW (Top picture). It is time to get back to work on this fairing. My 50th High School Reunion in Anchorage is coming up in the summer of 2010. It is now or never. The Alcan Fairing is - obviously - being developed for traveling the Alcan Highway. To start with, it must be rugged. Therefore, the basic structure is aluminum. I am assuming that it will be cold and rainy - all the way. Our son, Zak has put thousands of miles on the #7 Alcan Fairing prototype on his KLR, riding daily 25 miles to work. Recently, he has been riding in California's El Nino rain. He arrives absolutely dry! He has no rain suit, either. This is a good start. Carol says: "It has better wind protection that any Windjammer I ever had! " Not only is Carol helping me to evaluate the Alcan Fairing mods, she is testing her new boots and jacket, getting ready for the ride. Carol would like to hear from seasoned Alcan Highway riders so she can be properly outfitted. Please contact her with specific items and brands of equipment. 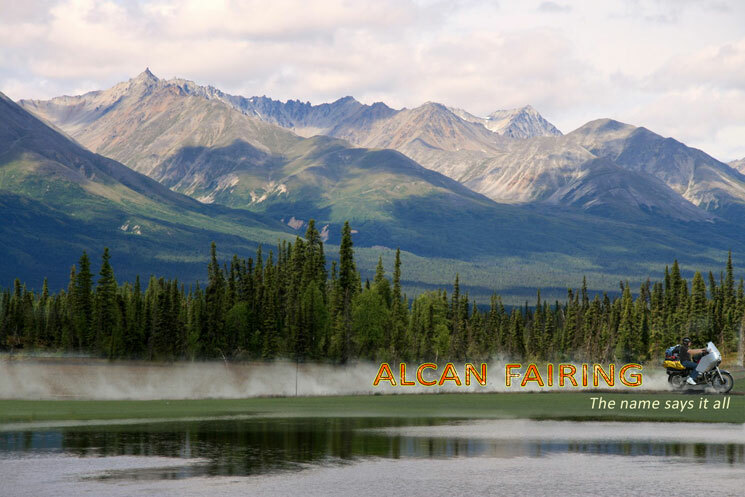 In the following weeks, I will post progress reports on developing the Alcan Fairing. It must be ready for a June departure. There is lots to do. We thank you for your suggestions and comments. Eventually, we may offer kits. Chapter 1: What, Why and When?